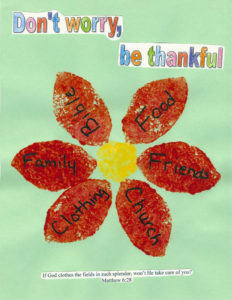 Looking for a Thanksgiving craft you can use in Sunday school to teach kids about thankfulness? Here’s the directory for you. 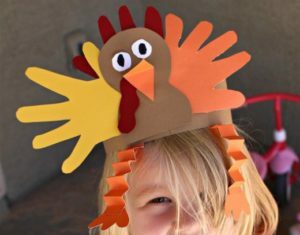 I’ve scoured the internet to find over 100 Thanksgiving craft ideas to help you give kids a fun time—and in many cases, a meaningful lesson, too. 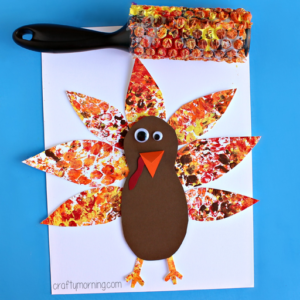 If you’ve got any great Thanksgiving craft ideas to add to the list, just leave me a comment! You might also be interested to check out this list of over 100 free Thanksgiving coloring pages, see what the Bible says about thankfulness, or learn what thanksgiving means in the Bible. With this craft, you’ll make a cool, 3D pumpkin with strips of paper where kids can write down what they’re thankful for. Don’t be scared off—it looks a little complex, but her instructions make it easy. To create a colorful thanksgiving craft experience, you can make some simple drawings on paper plates and let kids “color them in” with assortments of different thanksgiving-themed dry foods. 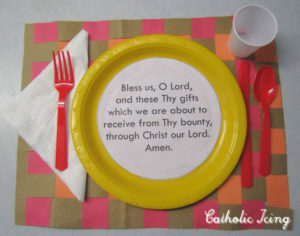 There’s a lot of room for variety with this idea, and it would be easy to make a Bible-themed drawing on the plates for different Sunday school object lessons. 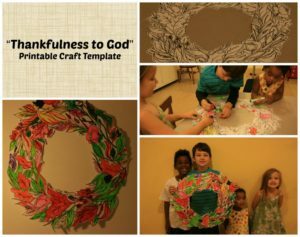 This article from the Sunday School app Disciplr includes a set of five crafts that deliver specific thankfulness object lessons. The thing that makes this list so great is that each Thanksgiving craft idea comes with a recommended Bible passage that ties in—perfect for Sunday School. This Thanksgiving craft includes a set of free print-outs that kids can cut out, tape together, color, and decorate. 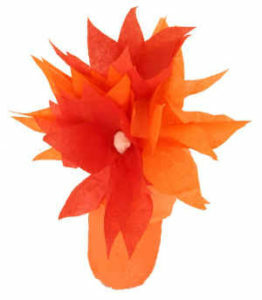 With this Thanksgiving garland craft, you’ll create multi-colored paper leaf cutouts. 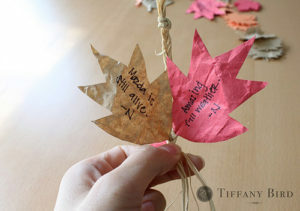 Leaves can be distributed among kids, where they can write a note on each about something they’re thankful for. 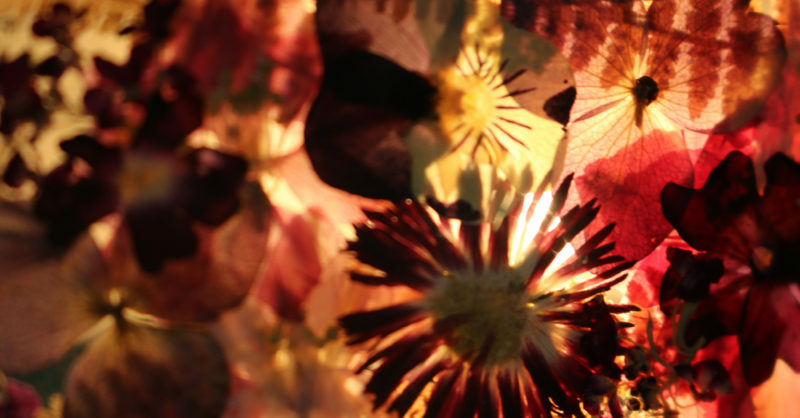 At the end, you can connect the leaves together in a collaborative garland. This is a creative, budget-friendly Thanksgiving craft. 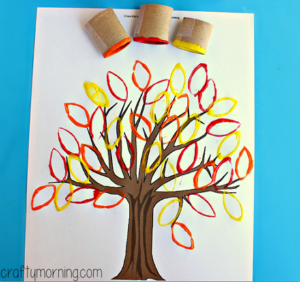 Kids can use toilet paper rolls as stamps to create leaf shapes in tree paintings. Lots of free printouts for lots of kids are included in this craft. 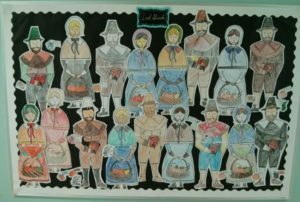 Each child can decorate and color a printed pilgrim character, and display theirs with all the other kids on a shared thankfulness bulletin board. 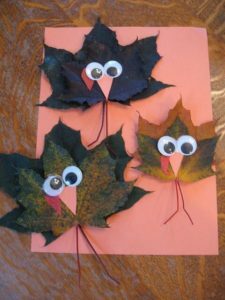 If you have time to take kids outside for a little field trip to gather leaves, this is a really easy craft with some really fun results. 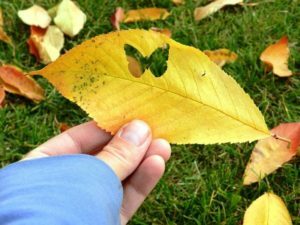 You’ll just punch leaves with a variety of shaped paper punches, and let kids arrange the shapes and glue them onto a piece of paper. 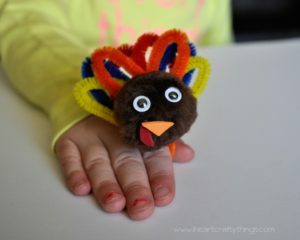 This craft features a goofy turkey ring made with pipe cleaners, pom-poms, and googly eyes. They would make great finger puppets, as well. This fun Thanksgiving craft idea involves using bubble wrap to print a colorful pattern on paper that kids can use as the feathers of a paper turkey. 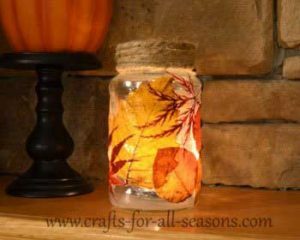 Kids of all ages can create a beautiful autumn candle jar by decoupaging fallen leaves onto a simple mason jar, and placing a votive inside. 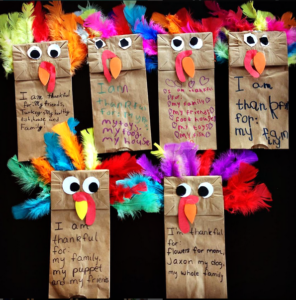 This cute turkey hand puppet is a way to get kids thinking about what they’re thankful for, and also end up with a fun toy to goof around with at the end. Speaking of turkey puppets, here’s another fun one kids can make. This one is attached to the end of a popsicle stick, and uses simple and cheap materials like cupcake liners. 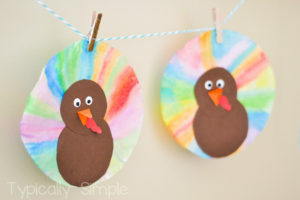 Here’s a really simple turkey craft that even the littlest kids should be able to make. You only need a few supplies and a few steps to finish it. 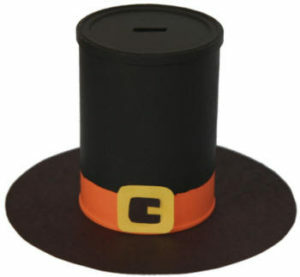 This fun craft idea can also be functional: kids can use the pilgrim hat coffee can as a little bank to collect coins, or you can use one in Sunday school where kids can bring spare change to give away. This simple and fun turkey wreath only requires some construction paper, a paper plate, glue, and some markers. 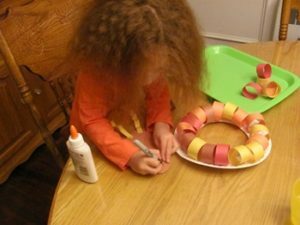 For an added “thankfulness” exercise, kids can write things they’re thankful for on the paper rings. This Thanksgiving lantern craft is low-hassle. You can print off the pattern for free and just cut, paste, and color according to the instructions. 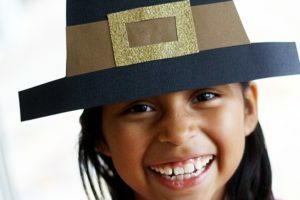 This pilgrim hat craft that kids can actually wear is sure to make them smile. All that’s required to make the hat is construction paper, staples, and glue. Using a basic household coffee filter, you can have kids make a colorful variation on a paper turkey craft using watercolors to paint the feathers. 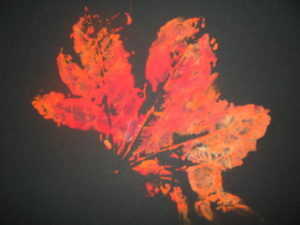 Make beautiful fall-themed prints using leaves that kids find outside. Here are the instructions on how to do it best. 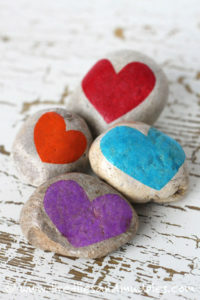 Gratitude stones are an attractive nature-themed craft designed to teach kids thankfulness. It includes a challenge to ask kids just why it is they say thank you, and what causes someone to feel gratitude. With this Thanksgiving craft, you can teach kids to be grateful for the meal they’re about to eat, and the good habit of praying at the beginning of a meal. This is the perfect craft for kids who missed out on carving pumpkins (either because they were too young or other reasons). 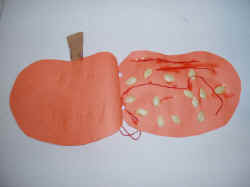 It gives them a fun pumpkin craft that can be used to teach them about thankfulness. This is an unusual approach to a turkey craft for slightly older kids. 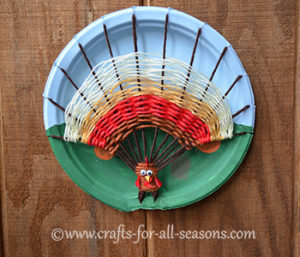 You’ll use a paper plate to create a sort of loom, and weave a turkey pattern onto it. You might think you’ve seen a lot of turkey crafts on this list. 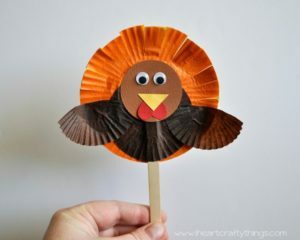 But you’re about to see the epic list of turkey crafts—this list from HubPages includes 59 of them! Not all of them will be suitable for Sunday school, but if you know you’re looking for something with a turkey theme, this is a good place to go. Kids can create a beautiful Thanksgiving flower (or a whole vase-full of them) to give as gifts to people they want to show thankfulness for. A great Sunday school exercise in both generosity and thankfulness. The instructions even include cut-out patterns for each flower shape. 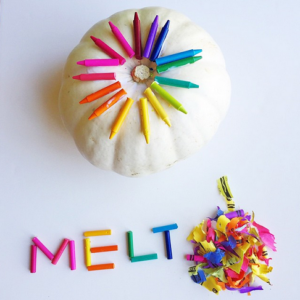 Artistic kids will love this melted crayon Thanksgiving craft—and their parents will enjoy using these pumpkins as decoration throughout the holiday. 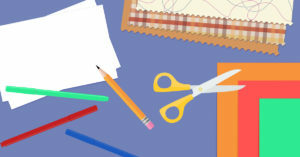 With a little help from a blow-dryer, you can help even the youngest children safely make these cool crafts. This Bible craft gives kids an artistic take-home that helps them memorize scripture. 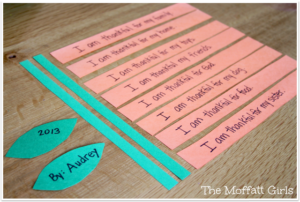 You’ll create a page with items the children are thankful for that will feature a memory verse. Kids can decorate it however they like. 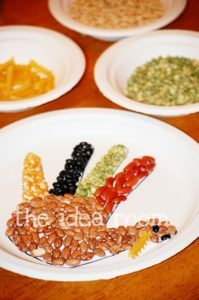 This combo Thanksgiving craft and activity is perfect for the littlest toddlers. 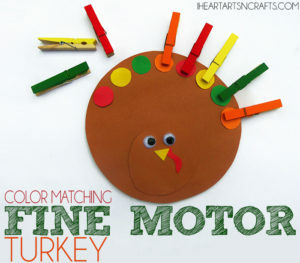 They’ll get to join in on the crafting fun by matching colored clothespins to bits of color on a paper turkey craft. This paper-plate wreath is a great project for lots of kindergarten-aged kids to collaborate on. The more kids involved, the fuller your finished wreath will be. The article describes a variety of approaches you can take to making a paper plate wreath that’s perfect for your Sunday school class. 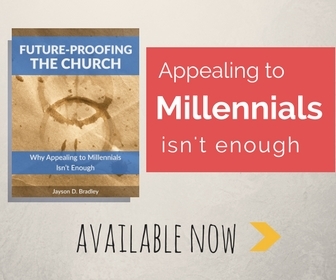 Have other great suggestions or Thanksgiving craft ideas suitable for Sunday school? Share them in the comments! Thank you! This is a wonderful resource!! We are looking for better crafts for our Faith Kids program..these are simple and fun. Glad to hear it, Linda! Thanks for stopping by.